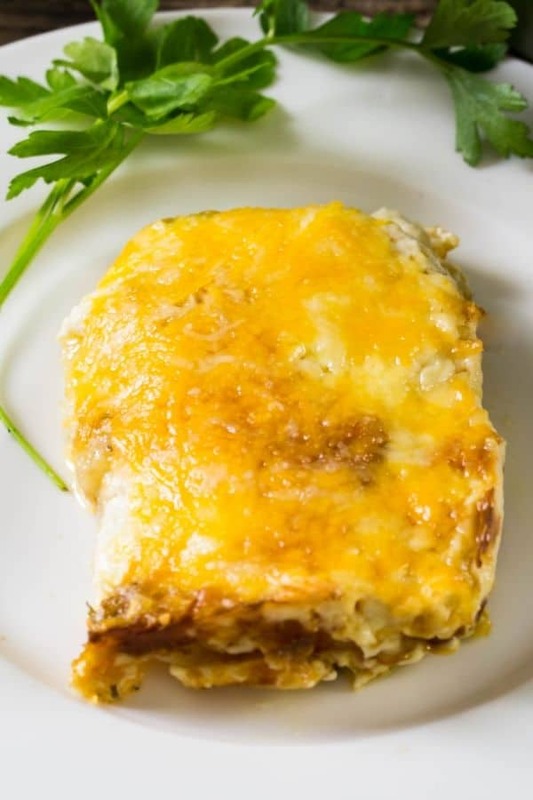 Easy Cheesy Scalloped Potatoes are a fantastic cheesy potato side dish! Cheesy goodness that I always associate with comfort food and family. These potatoes are a favorite Holiday side dish for my family! Cheese and potatoes, a match made in heaven! Now some say scalloped potatoes while others say au gratin! Me, I say call these whatever you want as long as you make them, so darn delicious! 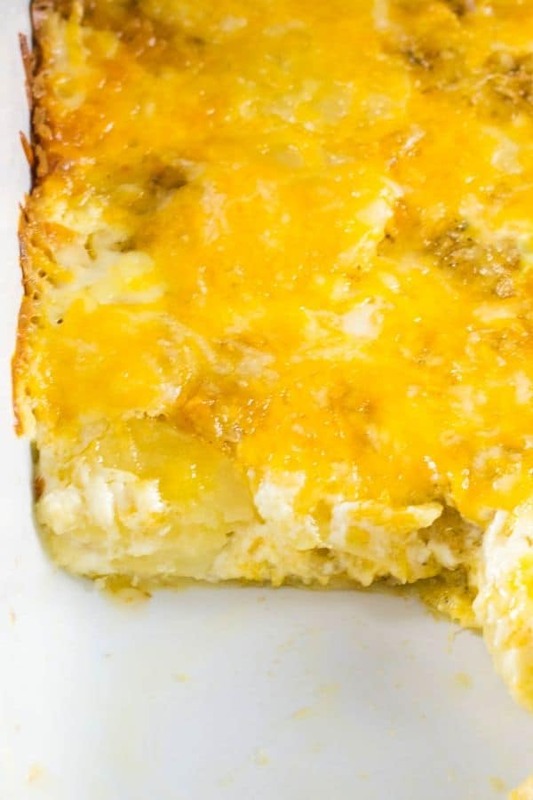 These Cheesy Scalloped Potatoes are very easy to put together! Many scalloped and au gratin potato recipes call for making a cream or cheese sauce for the potatoes. Well, my friends, I have spent a lot of time figuring out how to make the prep work for this recipe as easy as possible! You are going to love how easy it is to make these delicious cheesy potatoes. Thanksgiving is coming up and I’m focusing on side dishes this week! My Scalloped Potatoes Recipe was an obvious no-brainer, must share with you! How could I not, it’s about time! What I love about these potatoes is how easy it is to make and how delicious they taste! The potatoes are layered and then there is the addition of cream, diced onions with spices and herbs, and of course cheddar cheese! Yum! I could eat the entire bowl of these cheesy potatoes! Where does the name Scalloped Potatoes originate? The theory of scalloped potatoes is the potatoes are fanned in the casserole dish and look like a scallop shell, so there ya go Scalloped Potatoes! Can Cheesy Scalloped Potatoes be made ahead and stored in the freezer? Unfortunately, any dish with cream usually does not freeze well! Scalloped potatoes would not do well frozen. In theory, scalloped potatoes have a creamy sauce with herbs while au gratin potatoes usually sliced thinner and have cheese and breadcrumbs. The lines often cross often as in this recipe. This is my scalloped potato recipe forever and that’s that! Can Cheesy Scalloped Potatoes be made ahead and reheated? Yes, I have made this recipe a day ahead and baked it for an hour. Let it cool, cover with foil and keep in the fridge. Finish cooking when ready to eat with foil on for about 20 minutes. 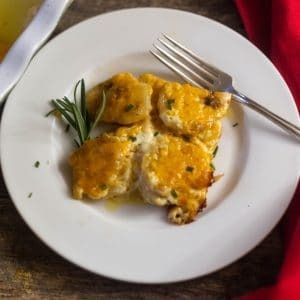 What types of potatoes are best to make this potato recipe? The sauce is creamy for scalloped potatoes and a starchy potato goes best with this recipe. Use either Russet or Yukon or a combo of both for Cheesy Scalloped Potatoes. Can you vary the cheese to make Cheesy Scalloped Potatoes? I always tell you, cooking is great because you can use your imagination. I use Parmesan Reggiano and cheddar cheese in this recipe. 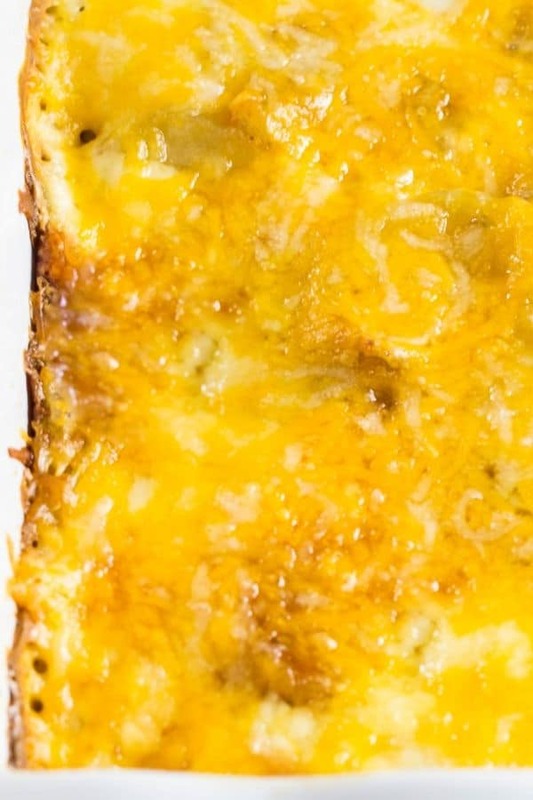 You can use other cheeses like gruyere and Colby Jack. Use your imagination. What can you serve Cheesy Potatoes with? Mandolin Slicer: Using a mandolin slicer makes this recipe even easier to make! This is a great mandolin and I use it all the time. Casserole Dish: This 3 piece set is awesome. Great for this recipe but also for pasta, chicken, various one dish recipes! I also have a store where I am always updating great finds for not just cooking, I hope you check it out here, Everyday Eileen I will continue to update it regularly! 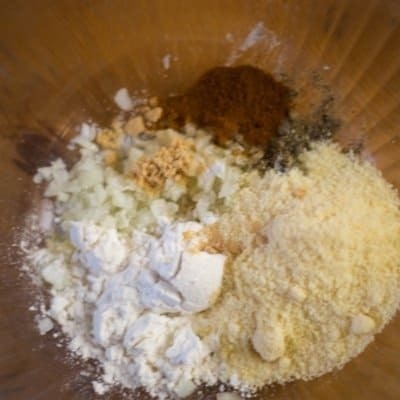 In a large bowl, combine chopped onions, Parmesan Reggiano cheese, flour, dried parsley, ground thyme, garlic powder, salt, black pepper, paprika, and dry mustard. Stir to combine. Set aside. Shred 2 cups cheddar cheese. Lightly butter a 9×13 casserole dish. 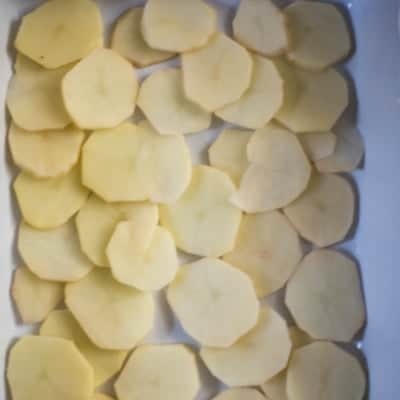 Use a mandolin slicer ( if you have one) to slice the peeled potatoes using the 1/8 inch slice. Spread half of the sliced potatoes in the bottom of the casserole dish. Sprinkle half of the onion Parmesan Reggiano cheese mixture over the potatoes. Add half the shredded cheddar cheese on the potatoes. Pour the cream over the entire potato mixture. Cover the dish with foil and bake at 350 degrees for about 1 hour. Remove foil bake another 15 minutes, to cook potatoes through. Adding this delicious cheesy potato side dish to your Thanksgiving, Holiday, or family celebration is going to be a crowd pleaser. Feel free to make this a day ahead and reheat when ready to eat! If you enjoy this recipe, please give it a 5-star rating! Also, any comments are super helpful for me and very much appreciated! Delicious thinly sliced potatoes layered with cream, cheddar cheese, and herbs. A great side dish for any Holiday or family gathering! Preheat oven to 350 degrees. Lightly spray a 9x13 casserole dish with butter spray. Set aside. In a bowl, combine diced onion, Parmesan Reggiano cheese, flour, parsley, thyme, garlic powder, Kosher salt, black pepper, paprika, and dry mustard. Stir to combine. Set aside. Place half of the sliced potato mixture into the casserole dish. Sprinkle half the butter pieces over the potatoes, then half the onion Parmesan Reggiano mixture on top of the potato layer. Sprinkle half the shredded cheddar cheese mixture onto the potatoes. 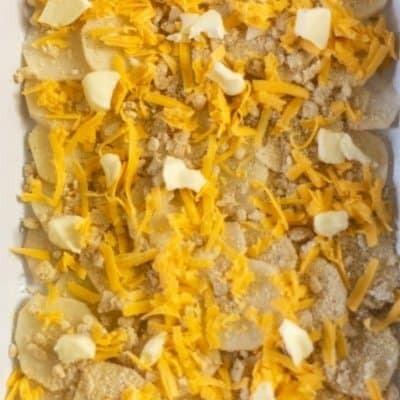 Repeat the layering of potatoes, remaining butter, onion mix, cheddar cheese mixture. Gently pour the cream over the entire mixture. Note 1: Use either Russet or Yukon Gold potatoes and slice potatoes 1/8 inch thick. If you do not have a Mandolin slicer, thinly slice potatoes after you peel them. Very important, if potatoes are thicker, you will need to increase baking time for the potatoes. Note 2: Fat-free half-and-half can be swapped out for the light cream. Note 3: I use a low-fat cheese when possible. Note 4: If you prefer a Gluten-Free dish, use almond flour. Note 5: Depending on how thick you sliced the potatoes, they may need more time. If they are sliced 1/8 inch, they should be cooked through. Note 6: If you want to make ahead, make the day before and bake for one hour covered with foil. When ready to finish, cook another 20 minutes covered. Now that is a side that is calling my name. I’m a big fan of cheese and potatoes together, so good!